The RTC will soon be making upgrades to the intersection of Pyramid Way and McCarran Boulevard which is along my regular bicycle commuting route. The landscaping, aesthetics and access concepts may start as early as Spring 2015. 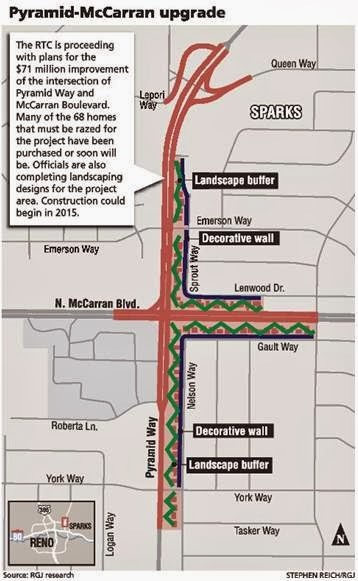 There is also a 10-foot-wide path for pedestrians and bicyclists planned for that will meander through the area to make the area more walkable. The plan also includes the widening of Pyramid to three lanes in each direction with new turn lanes installed on both Pyramid and McCarran. Turn lanes for motor vehicles means having a safer position to stop for bicyclists who can be out of the way of motorists making right turns and running over them. Still, merge lanes are not without risks (which is an issue I will talk about in another post). What: RTC is hosting a public meeting to examine what widened road, improved intersection and adjoined landscaping might look like. When: Thursday, February 27th, 5 p.m. to 7 p.m.
Where: Sparks Masonic Building Association, 2425 Pyramid Way, Sparks, NV. If this is an intersection that you frequently commute, pleasreference to attend the meeting. If you cannot and would to share your concerns, comments or questions, please do so in this post and I will do my best to voice it for you during the meeting's Q&A. I hope you can make it! Comments can also be emailed to info@pyramidmccarran.com with reference to the "Pyramid Way and Mccarran Boulevard Intersection Improvement Project" in the subject line. Comments will be accepted until 5pm Thursday, March 6, 2014.